Prefectures in the territory of the Vestini: Aveia ? and Peltuinum ? Prefectures in the territory of the Praetutti: Interamnia Praetuttorium ? Prefectures in Umbria: Interamna Nahars ? Festus’ second list of prefectures contains two in Sabine territory: Reate (Rieti) and Nursia (Norcia). There is also late epigraphic evidence (discussed below) for a prefecture at Amiternum (a centre that was abandoned in the Middle Ages for nearby L’Aquila). These three centres were located in the upland alta Sabina: this was geographically distinct from Sabina tiberina, the lowland area towards Rome that was centred on Cures and that was renowned in Roman pre-history as the birthplace of two of the early kings of Rome. “[In 293 BC, the consul], Spirius Carvilius, to whom had been decreed the veteran legions [that his predecessor] had left in the territory of Interamna, marched at their head into Samnium; and ... took by storm the Samnite town of Amiternum. Here were slain about 2,800 men, and 4,270 were made prisoners”, (‘History of Rome’, 10: 39: 2). “Consul [Manius] Curius Dentatus celebrated two triumphs in one year, because he had defeated the Samnites and had also subdued the rebellious Sabines and accepted their surrender”, (‘Periochae’, 11: 5-6). “Marcus Curius Dentatus first celebrated a triumph over the Samnites, whom he completely pacified as far as the Adriatic. When he returned [to Rome], he said in an assembly: ‘I have taken so much land that it would have become a desert if I had not [also] taken so many men, and I have taken so many men they would have died of hunger if I had not [also] taken so much land. He celebrated a second triumph over the Sabines. He entered the city for the third time [as consul], receiving an ovation for the defeat of the Lucanians”, (‘De viris illustribus urbis Romae’, 33: 1-3, my translation). “... [the Romans] attacked the race of the Sabines who, forgetful of the relationship [that they had] formed [with the Romans] under Titus Tatius, had become ... infected by the [rebellious] spirit of the Latins and had joined in their wars. During the [first] consulship of Manius Curius Dentatus [i.e. in 290 BC], the Romans laid waste with fire and sword all the tract of country which is enclosed by the Nar, the Anio and the sources of the Velinus, and bounded by the Adriatic Sea. By this conquest, so large a population and so vast a territory was reduced, that even [Curius] could not tell which was of greater importance”, (‘Epitome of Roman History’, 1: 10). “When the Sabines levied a large army, left their own territory and invaded ours, Manius Curius, by secret routes, sent ... a force that ravaged their lands and villages and set fire to them in divers places. In order to avert this destruction of their country, the Sabines thereupon withdrew [from Roman territory]. But Curius succeeded in devastating their country while it was unguarded, [and then ?] in repelling their army without an engagement and ... slaughtering it piecemeal”, (‘Stratagems’, 1: 8: 4). “[In 290 BC], the consul Curius waged a war against the Sabines. In this war, the consul himself tells us how many thousand men were killed and captured. When in the Senate, he wished to report the amount of the land acquired from the Sabines and the number of their inhabitants captured, he was not able to give exact figures”, (‘History, against the Pagans’, 3: 22: 1). “Curius, in defending his conduct before the people, declared that he had acquired so much land that any smaller number of men could not have tilled it, and had captured so many men that any smaller territory would have been insufficient for them”, (‘Roman History’, 37:1). Whatever the pre-history of Curius’ invasion of 290 BC, the surviving accounts all focus on the fact that large numbers of Sabines were killed or captured in this campaign and that their territory was effectively confiscated in its entirety (albeit that claims of complete genocide seem to be over-stated). Indeed, these confiscations extended beyond the Sabine lands, reaching the coast of the Adriatic (as discussed below). “Curius Dentatus ... after his conquest of the Sabines, [was often found] tilling the captured land that [he] had received in the distribution of 7 iugera per man”, (‘De Re Rustica’, 1: 14). “The words ... that were uttered by Manius Curius after his triumphs [over the Samnites andSabines] and the addition of an immense extent of territory to the Roman sway, are well known: ‘The man must be looked upon ... as a dangerous citizen, for whom 7 iugera of land are not enough, that being the amount of land that had been allotted to the people [of Rome] after the expulsion of the kings’”, (‘Natural History’, 18:4:18). “When, in honour of his defeat of the Sabines, the Senate offered Manius Curius a larger amount of ground than the discharged troops were receiving, he was [instead] content with the allotment of ordinary soldiers, declaring that man was a bad citizen who was not satisfied with what the rest received”, (‘Stratagems’, 4: 3: 12). “When some blamed Curius for distributing but a small part of a country he took from the enemy [presumably in 290 BC] and preserving the greater part for the commonwealth, he prayed that there might be no Roman who would [regard an] estate [as] little [if it] was enough to maintain him”, (‘Sayings of Kings and Commanders’, search on ‘Curius’). Similarly small parcels of land might well have been distributed to civilian citizens from Rome. “As the Romans became masters of all nations, they divided up among the victorious people [i.e. themselves] land captured from the enemy. But they sold other land, for example the land of the Sabines, which is called ‘quaestorian’” (translated by Saskia Roselaar, referenced below, at p. 125). Tacitus (‘Annals’, 1: 79) recorded a further legal dispute on this matter between Interamna Nahars and Reate in 15 AD. 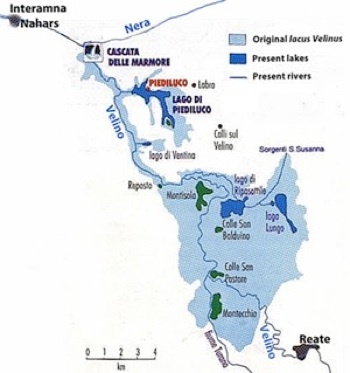 Curius had apparently opened an artificial channel to divert the water of this large, upland lake over a precipice and into the Nar (Nera), forming what is now the Cascata delle Marmore. This work, which is usually thought to have been carried out in Curius’ period as censor in 272 BC, would have provided a significant expanse of newly-reclaimed fertile land for distribution. “... the citizenship without the right of suffrage was given to the Sabines in the consulship of Manius Curius and Rufinus Cornelius [i.e. in 290 BC. ... In 268 BC,] the right of suffrage was granted to the Sabines”, (‘History of Rome’, 1: 14: 6-7). “In Roman eyes, the Sabines proper were the Curienses [people of Cures in Sabina tiburina] ... [They] were the ‘Sabines’ of Velleius, who got partial citizenship in 290 BC and the vote in 268 BC ...” (word order amended). “... the only part of the local population that survived (fiscally and legally) the massacre and enslavement ... [of] 290 BC” (my translation). In other words, in Sisani’s view, there were probably very few native Sabines to be found in the alta Sabina at this time. If this is correct, then the enfranchisement of 268 BC would not have created clients for a prefect based in the the alta Sabina, but it is possible that some of the survivors in this region were enfranchised at a later date. •the Velina received the territory of the Praetuttii (see below), including Interamnia Praetuttorum. 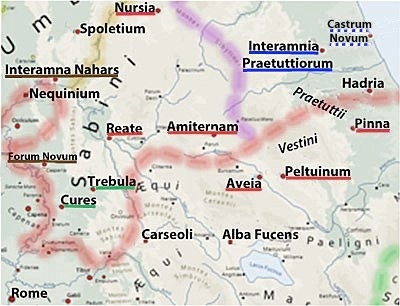 “The new settlers [in the alta Sabina] ... might well have arrived while Curius was still alive, ... remaining in their own original tribes until the foundation of the Quirina, a development that belonged to a wider territorial restructuring that included the foundation, also in 241 BC, of the Latin colony of Spoletium” (my translation). “... Sabines and Etruscans ... , [who sent] to Rome, for that special occasion, 4,000 horse and more than 50,000 foot. These were formed into an army and sent in advance into Etruria, under the command of one of the Praetors, (‘Histories’, 2:24: 4-5). On this model, viritane settlement would have begun soon after this land reclamation, albeit that the re-assignation of the early settlers to the Quirina would have been delayed until 241 BC. ✴the prefecture at Amiternum was established thereafter, once the settlement of the alta Sabina was complete. “... the people of Nursia, Reate, and Amiternum, and all those of the Sabine territory, promised soldiers” (‘History of Rome’, 28: 45: 19). It seems that they had all been relatively insignificant centres before the conquest (as discussed below), so we might reasonably assume that they had all achieved this apparent prominence as the seats of Roman prefects. Thus, Knapp considered Reate and Nursia (which were named by Festus) to be examples of prefectures that were constituted in towns with established constitutions. However, as we shall see below, the Sabine prefectures seem to have lacked local magistrates at least until the late Republic. “The circuit of walls at [Reate] ... seem to represent the only urban initiative of any significance [undertaken there] until well into the 1st century BC ...” (my translation). These later Roman structures presumably belonged to the centre that Cicero (below) felt able to describe as “a most eminent prefecture” in 54 BC. “There are no existing elements that allow the determination of the chronology of [this] urban settlement ..., apart from information derived from the building technique adopted for the walls, ... [which were probably not earlier than] the late 2nd century BC” (my translation). (As discussed above, Simone Sisani saw the appearance of praefecti iure dicundo at Amiternum as evidence of its municipalisation towards the end of the 1st century BC). ✴the “most eminent prefecture” of Reate, in his defence of the centre in the case brought by Interamna Nahars in 54 BC described above (‘Pro Scauro’, 27). It is impossible to say whether Cicero conceived as Reate as a prefecture in 168 BC, or whether this was simply its status at the time of writing. However, it is clear that Reate was still a prefecture in 54 BC. This is confirmed by an inscription (CIL IX 4677) from the period between Agrippa’s 3rd and 4th consulates (23 - 18 BC), which records him as the patron of what was still, at that time, the prefecture of Reate. ✴it was eventually a quattuorvirate, as evidenced by two inscriptions: CIL IX 4754 (late 1st century AD); and CIL IX 4753 (2nd century AD). ‘Quintus Octavius ..., octovir, II ...’. Octavius was thus a member of the college of eight magistrates that administered Nursia by this time. •CIL IX 4622 recorded the complete cursus of Q. Aufidius Iustus, who had held the posts of: municipal haruspex; octovir; and ‘praefectus iure dicundo by decree of the local senate’. Sisani dated all three to the very early imperial period, while Maria Carla Spadoni dated CIL IX 4622 to the second half of the 1st century AD or first half of the 2nd century AD. In this period, three other inscriptions (CIL IX 4398, CIL IX 4440; and CIL IX 4400) recorded individual octoviri and a fourth (CIL IX 4205) recorded an aedile. Thus, the prefecture at Amiternum existed alongside the octovirate in the middle of the 1st century BC and survived until at least 19 BC. Another inscription (CIL IX 4270) from Amiternum, which Sisani (at p. 201) dated to the early decades of the 1st century AD, commemorated P. Lucceius Clemens, an aedile and a praefectus iure dicundo. Maria Carla Spadoni (referenced below, at pp. 70-1, entry 72), who dated this to a slightly earlier period (late 1st century BC to early 1st century AD), pointed out that Lucceius’ assignation to the Quirina confirmed his local origins. •Amiternum, at least until 19 BC (CIL IX 4182). •Amiternum ( CIL IX 4398, CIL IX 4400 and a third inscription published by Simonetta Segenni, referenced below, at p. 722). Since Reate and Amiternum were certainly still receiving Roman prefects at this time, Sisani argued that the new octovirate was a Roman imposition and not, as is sometimes claimed, an evolution of an unattested Sabine precursor. These octoviri were not involved initially in administering justice, which remained the preserve of the Roman prefects. •at Amiternum, where P. Lucceius Clemens, a local man (as evidenced by his assignation to the Quirina), served as aedile and praefectus iure dicundo (CIL IX 4270). “... supplementing the [octovirate] with [another] local magistrate with judicial power [i.e. the praefectus iure dicundo], who replaced the Roman prefect ...” (my translation). The evidence set out above suggests that the prefectures of the alta Sabina fell into this category, at least until the appearance of the Roman-imposed octovirate in the late Republic. However, there is no evidence that the octovirate took over functions that had previously been the prefect’s responsibility. Rather, his responsibilities seem to have remained unchanged until municipalisation, when they were assumed by the local praefectus iure dicundo. “... the Romans laid waste with fire and sword all the tract of country which is enclosed by the Nar, the Anio and the sources of the Velinus, and bounded by the Adriatic Sea”, (‘Epitome of Roman History’, 1: 10: 15). ✴those at Interamnia Praetuttiorum, in the territory of the Praetuttii, were assigned to the Velina. As noted above, Robert Knapp (referenced below, at p. 23) suggested that both Aveia and Peltuinum had been constituted as prefectures. However, as discussed below, the inscriptions on which he based this suggestion ( CIL IX 3613 and 3627 for Aveia and CIL IX 3429 for Peltuinum) do not necessarily bear this interpretation. ✴an inscription (CIL IX 3613) from Aveia recording a praefectus iure dicundo who was assigned to the Quirina and who subsequently held the posts of quaestor, flamen of Augustus and curator for the Via Claudia Nova. On the basis of these inscriptions, Robert Knapp (referenced below, at p. 23 and note 42) concluded that Aveia had been a prefecture in the Republican period (as noted above). Whether or not Peltuinum was correctly designated as a colony, it seems to me that Sisani’s suggestion is at least plausible, and that Peltuinum was the seat of a local prefect who administered justice to citizen settlers, including some who had received land that had previously belonged to Aviea. In other words, the inscriptions above do not indicate that Aviea itself was once a Roman prefecture. ✴the fourth was a praefectus quinquennalis, Q. Statius Verecundus (CIL IX 3385 ), at p. 82, entry 91. ✴an inscription (CIL IX 3429) of 242 AD, in which the council of Peltuinum celebrated Nummia Varia as the patron “praefecturae nostrae” (of our prefecture) (at p. 188). On the basis of the last of these inscriptions, Robert Knapp (referenced below, at p. 23 and note 43) concluded that Peltuinum had been a prefecture in the Republican period (as noted above). “ ... a municipium that continued to regard its territory as a praefectura” (my translation). If this is correct, then Peltuinum, like Aveia, lies outside the scope of this analysis because it was not constituted as a prefecture before the Social War. M. Chiabà (Ed. ), “Hoc Quoque Laboris Praemium: Scritti in Onore di Gino Bandelli”, (2014) Trieste, at pp. 219- 42.